February expiration Friday has been a market turning point in many past years. Earnings are fading, Q1 earnings are declining, the major indexes are up 10% for the year and investors are starting to think about raising money for their taxes. While some traders will use the money right up until April 15th, others don't want to get locked into a trade where they could be forced to lose money if they have to exit to raise cash. US negotiators, Mnuchin and Lighthizer, are headed to China this week to continue the talks held in the US the prior week. They are expected to last a couple days. Contrary to prior expectations we learned there is no scheduled meeting between President Trump and President Xi. This suggests as Larry Kudlow said on Thursday, we have a "sizeable distance to go" before we have a deal with China. Mnuchin said talks have been "very productive" but there remains a "wide range of issues" to be worked out. With no meeting of the presidents before the March 1st deadline to raise tariffs from 10% to 25% that means we are approaching a critical point in the negotiations. This means it is also a critical turning point for the market as well. Expectations have been high but there is significant risk ahead that another quarter could transpire, along with thousands of negative headlines, before a deal is reached. This began to weigh on the market last week. Even though the major indexes finished with a weekly gain it was miniscule and no reason to get excited. If anything, having the Dow stretch its winning streak to 7-weeks is just one more reason for investors to be cautious because you know there is a real bout of profit taking at some point in our future. It would have been more bullish to give back 200-300 points for the week and have investors believe it was a great buying opportunity. 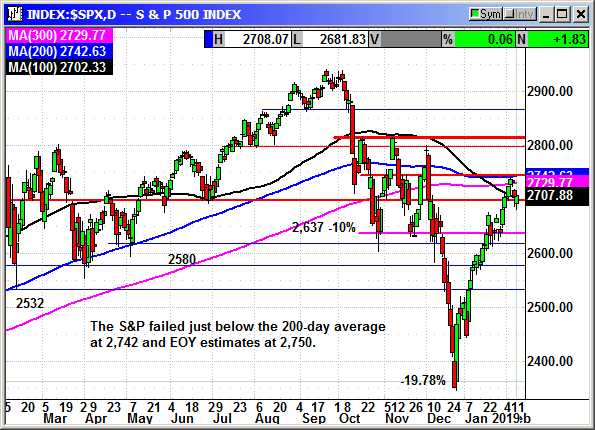 The S&P traded below 2,700 on both of the last two days but recovered to close over that level. 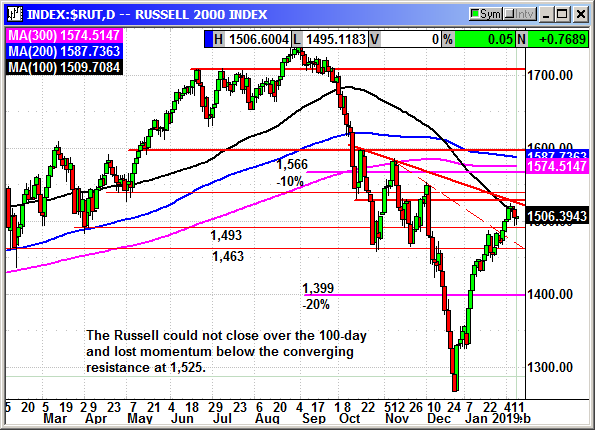 The index is stuck below the confluence of multiple resistance levels with the 200-day at 2,742 the biggest threat. Assuming a lack of bad news over the weekend we could see that level retested next week. 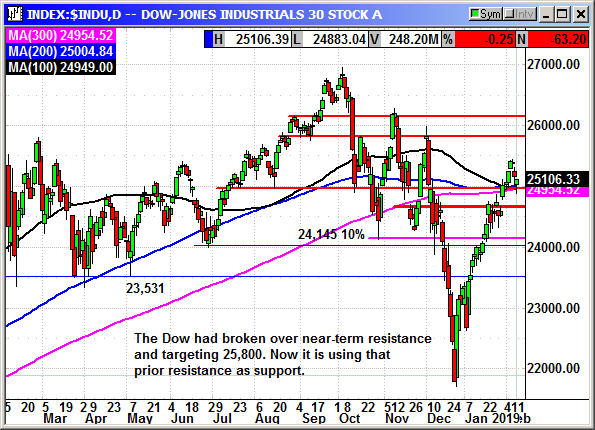 The Dow broke through the cluster of moving averages and was on its way to 25,800 when the weakness began. Now the index is using that prior resistance as support. This is about the right level to rest after trading below 25,000 intraday on Friday. The close was 123 points above the intraday lows and back above resistance. This would be a good spot to launch a new move higher. 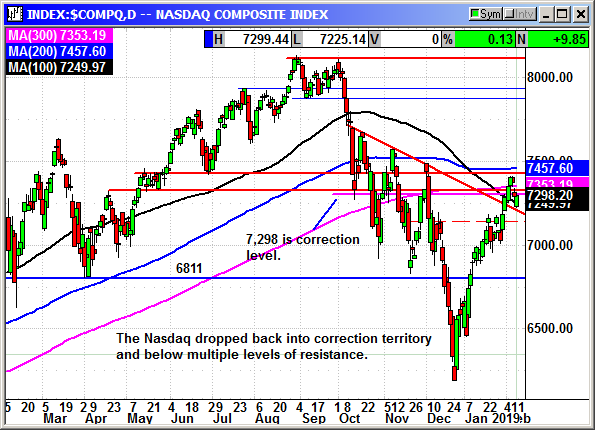 The Nasdaq fell back into correction territory intraday and closed exactly on that 7,298 level. Amazon was the big drag on the index with a couple biotech companies leading the winners list. The tech sector rebounded with the chip stocks, but that rally has given up ground the last two days. With the majority of the big tech stocks already reported we are headed into the post earnings depression period. The Russell posted a minor 4-point gain for the week, but it was a fight. The index traded on both sides of the 100-day average multiple times but lost the battle on Friday. This week and next is small cap earnings and there are rarely any market movers. This is a herd mentality. If they majority do well the index will rise. With the potential fading for an end of February trade deal, the global economy slowing, Q1 earnings turning negative and a 10% rally since Christmas, there are plenty of reasons to be cautious in the weeks ahead. We closed the short put at the open on Feb 1st. Closed Feb $180 short put, entry $2.08, exit .05, +2.03 gain. We closed this short put at the open on Feb 1st. Closed Feb $115 short put, entry $2.20, exit .03, +2.17 gain. Autodesk is also on the verge of making a new high and we can sell well out of the money for a decent premium. Earnings are at the end of the month so we will have to exit in about three weeks. Sell short Mar $135 Put, currently $2.33, stop loss $148.25. Adobe has broken free of the December decline and it moving up briskly. The close on Thursday was the 200-day average and the 100 is only 2 points higher. While those are resistance, a move over those levels should reach $260 or higher. Sell short Feb $230 put, currently $2.71, stop loss $238.50. 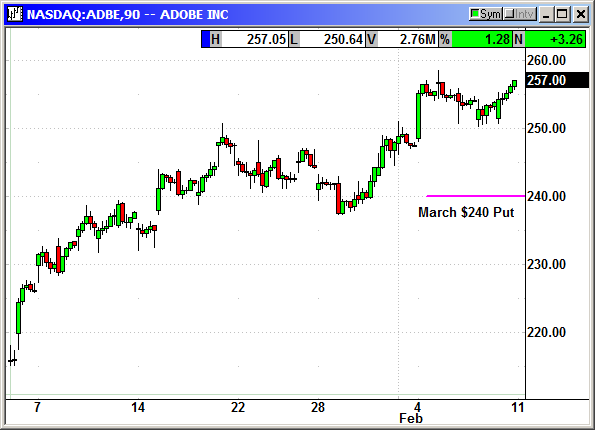 Update 1/31: No specific news on Adobe but the stock dropped with the Nasdaq on Tuesday to stop us out at $238.50. Closed Feb $230 short put, entry $2.23, exit $2.52, -.29 loss. 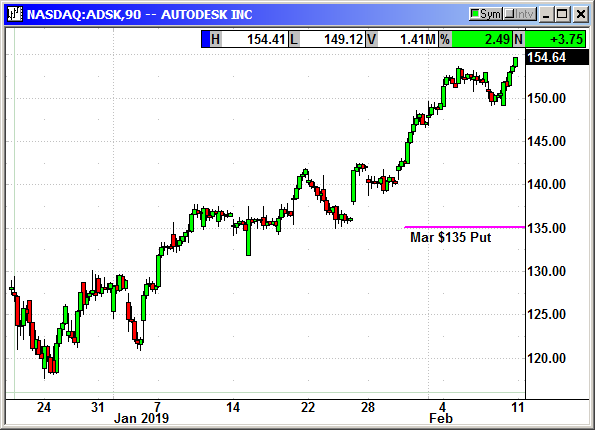 Autodesk closed at a 4-week high on Wednesday at $137 after a December low of $118. The company had been withstanding the decline rather well until they announced on the 20th that they were acquiring BuildingConnected, a leading construction bid-management platform for $275 million. Buyers almost always decline and while this is probably a good acquisition, there were some naysayers. Shares ahve recovered and premiums are high. Sell short Fed $125 put, currently $2.21, stop loss $129.35. Buy long Feb $115 put, currently $1.11, no stop loss. Alibaba appears to have bottomed at $130 as long as the market does not roll over again in January. The Feb put premiums are very high because earnings are Feb 1st. This means we will have to exit in late January. Sell short Feb $120 put, currently $3.20, stop loss $132.25. Update 1/3/19: The Apple revenue warning and claims that business declined sharply in China over the last two months, hit Alibaba hard and caused a $6 or -4.5% decline on Thursday. This stopped us out just after the open for a breakeven. Closed Feb $120 Put, entry $3.34, exit $3.35, -.01 loss. 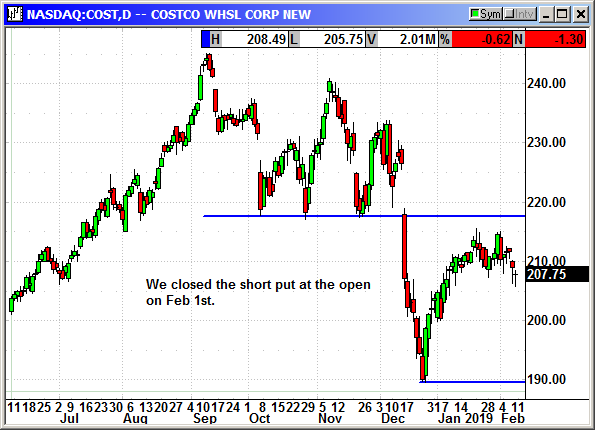 Costco bottomed at $190 after reporting earnings on the 13th. The earnings were great but they were picked apart by investors in a massively declining market. The $190 level should be the bottom unless the market rolls over again in January. Sell short Feb $180 put, currently $2.24, stop loss $193.25. 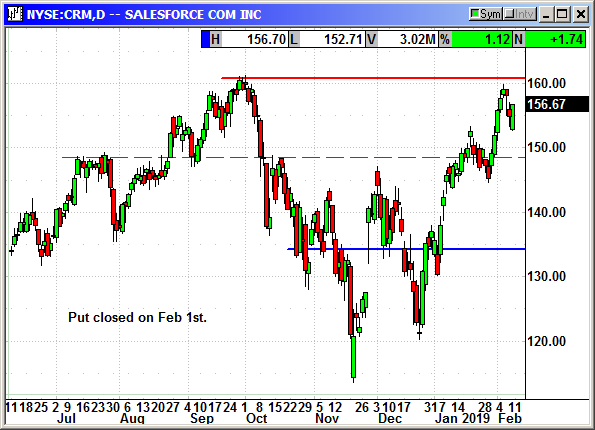 Salesforce has rallied $15 off the bottom at $120 over the last two days. If the market rally continues this will be a rocket back over $150. Sell short Feb $115 put, currently $2.29, stop loss $124.50. Intuit closed at a 4-week high on Thursday after the company announced its shareholder meeting would be on January 17th and would discuss the outlook for the company. This is tax season and Intuit earnings soar as millions of customers order tax forms from the company to use with their Quickbooks software. Sell short Feb $190 put, currently $2.20, stop loss $198.65. You could also sell the $190/$180 put spread for an 85 cent credit if you don't want to sell the put. Nvidia has not been star performer as in the past but it is starting to warm up. Dip buyers have done well but there is a long way to go to recover lost ground. The outlook for the company is great and it suffered with the chip sector on the way down. This company is the future of tomorrow. Sell short Feb $135 put, currently $3.10, stop loss $145.85. Update 1/31: We were killed on this position. Nividia announced an earnings warning before the open on Monday and fell $29 in the opening print. This was a massacre. The gap lower caused the stock to open below our stop loss and we were stopped at the open. Closed Feb $135 short put, entry $2.00, exit $7.00, -4.00 loss. Shopify has rebounded sharply from the November 20th low. Shares have rebounded to their mid November resistance at $151. If the positive market continues, SHOP should also break out and continue higher. Sell short Jan $125 Put, currently $3.00, stop loss $138.85. Update 12/20: SHOP shares were crushed after the company announced a secondary offering of 2.6 million shares. 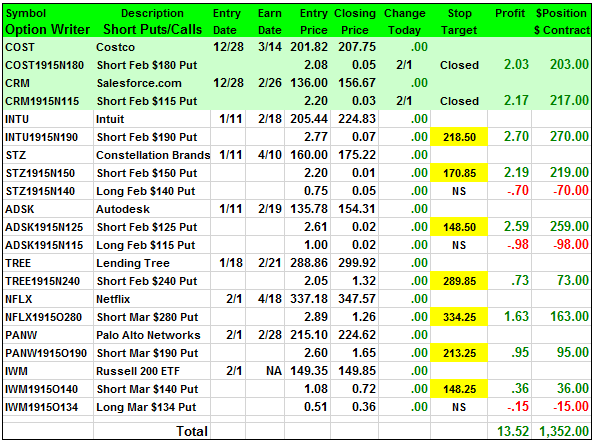 Closed 12/14: Short Jan $125 put, entry $2.90, exit $4.24, -1.34 loss. Sarepta tested the support of the 200-day average twice in November. Shares have returned to early November resistance at $130. I believe a positive market will allow SRPT to move higher. Sell short Jan $105 put, currently $3.05, stop loss $119.35. 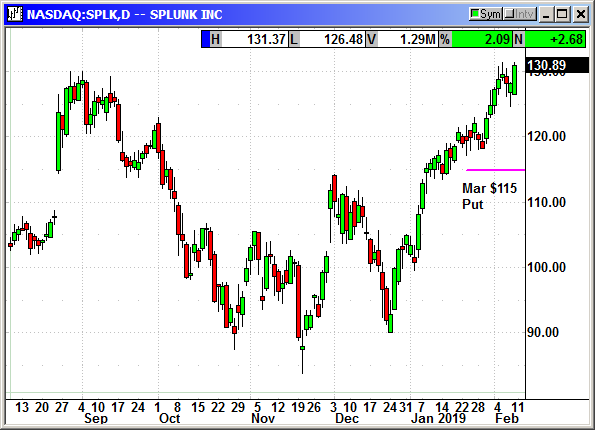 Update 12/13: Sarepta fell $10 from Dec 3rd high to the open on Dec 6th to stop us out of the short put. Closed Jan $105 short put, entry $3.23, exit $4.99, -1.76 loss. Shares were crushed for a $22 loss on Wednesday after the company posted weak guidance. They rebounded $9 on Thursday after the CEO appeared on CNBC saying the report was misconstrued and business was great. Guggenheim upgraded from sell to neutral and Goldman upgraded from neutral to buy. I am recommending we sell the dip. Sell short Feb $150 put, currently $2.10, stop loss $155.50. Buy long Feb $140 put, currently .90, no stop loss. Tree has gone vertical and broken out over the Nov/Dec resistance highs at $264. Shares are competing with Netflix for the biggest gain since Christmas with an $88 move. If it breaks out to a 10-month high over $288.40 there is nothing to hold it back from continuing its gains. Sell short Feb $240 Put, currently $2.00, stop loss $265.65.